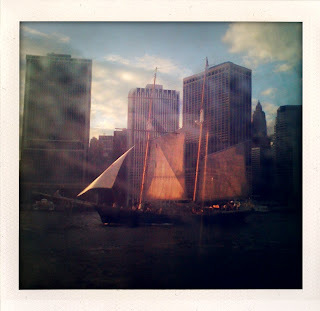 As Seen Through the Ferry Window, East River, Wednesday, 7:15 p.m.
yes, truly beautiful in fact. She looks like the sloop here in Norfolk, VA on the Elizabeth River and there is also a smaller one on the York River. It must have appeared mirage-like after your travels. I love this pic, it is really beautiful! Wow!!! that is incredible. It is like a dream! I do believe that's the Pioneer. You can take a ride on her from the South Street Seaport during the summer. Also, you can charter her. One of my favorite NY moments ever was quietly sneaking up on the Statue of Liberty at night on the Pioneer with a cold brew in my hand.